A friend from college recently moved from Philly to NYC. His apartment is in the East Village on 10th Street between 1st and A, which I consider to be a great area for food and drinks. I know a ton of great, cheap eats in the neighborhood since I used to live nearby, but we were still struggling to decide what to get. 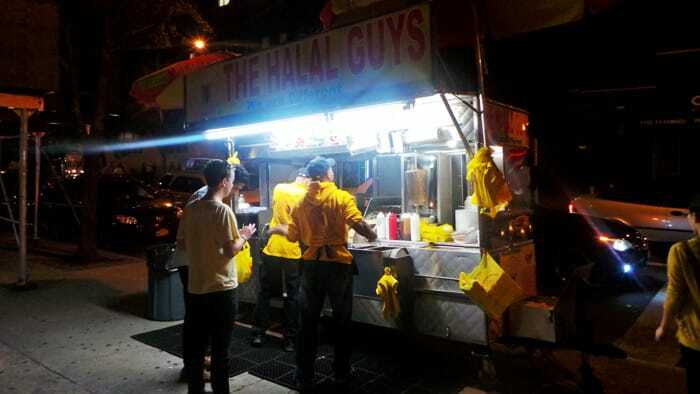 In a stroke of genius, I remembered that the Famous 53rd and 6th Halal Guys were opening up a brick-and-mortar location on the north edge of the East Village as well as a cart that had already launched. On this Saturday night, we wanted something quick, cheap, and tasty to prime us for the night of drinking ahead and this sounded like the perfect option. 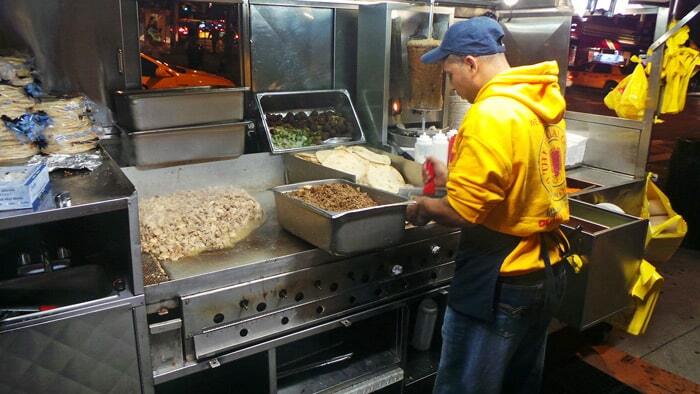 For those unfamiliar, the original location on 53rd and 6th is a very famous (and popular) late-night spot. People come from all over (rarely sober) and wait in a line that sometimes spans the entire avenue with hourlong waits for a container of chopped Halal meats over rice along with their famous red sauce and white sauce. They are so popular that there’s even an imposter cart that uses their distinctive yellow shirts and to-go bags on the same Midtown block. But those who know me know that I don’t wait in lines, so I’ve never taken the plunge to eat at the cart on 53rd. I’m quite happy that they’ve opened this new location since it’s much more convenient for me. Also, this location… has no line!! Everything about their setup is pretty standard for a Halal cart, but I will say, I was really impressed with how fast the food is prepared. The guys at the grill are very friendly and had both platters in my hand in under a minute. Pretty incredible. 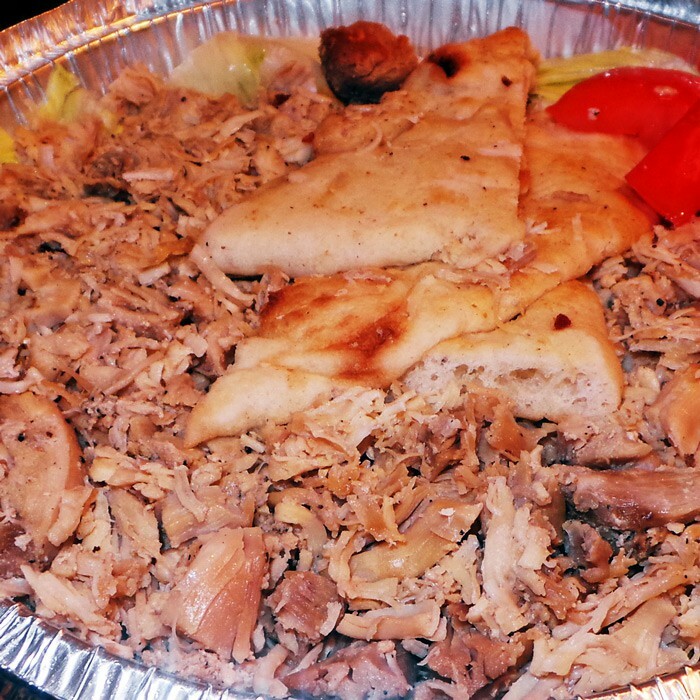 We decide to have both a Chicken over Rice Platter and a Gyro over Rice Platter so that we could try all of their offerings. Both come with the meat finely chopped over a bed of yellow rice. They also include some chopped lettuce, tomato, and pita slices, but they honestly don’t add much. They were kind enough to include the red sauce and white sauce in side containers so that we could apply them later, back at the apartment. I definitely prefer the gyro meat over the chicken. In fact, I think the chicken was pretty short on moisture and seasoning. 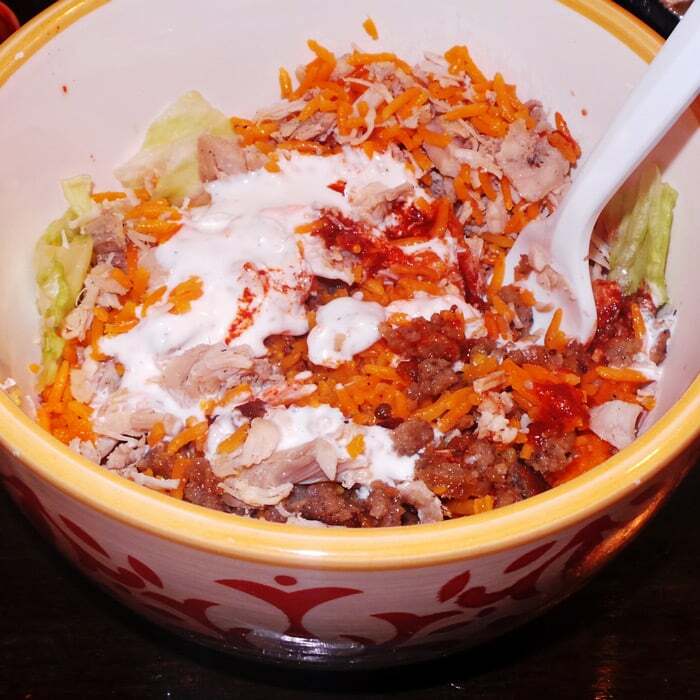 However, when you prepare a bowl and load it up with the red sauce and white sauce, there is more than enough flavor to boost up the unseasoned meat. I will warn though, that hot sauce is some the spiciest hot sauce I’ve ever had. 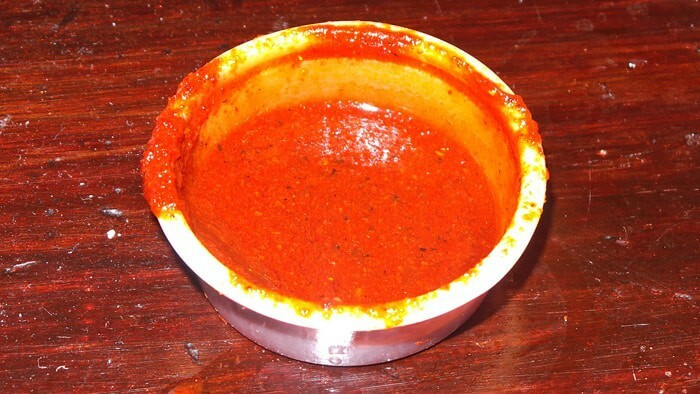 I didn’t think that dinky little plastic cup of hot sauce was going to be nearly enough based on my past experiences with other Halal carts’ red sauces. I was wrong. I pulled off the cap and licked the tiny bit that got on my finger and felt my tongue light up. It’s explosively hot, like coughing and burning up your nostrils hot. The amount of punch per drop makes it some of the most viciously spicy stuff I’ve ever tasted. So, go easy on it or you’ll regret it. 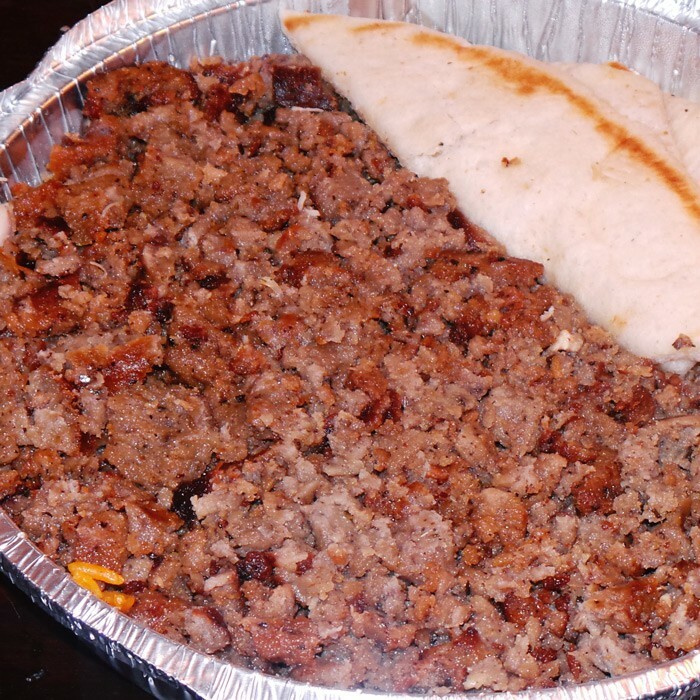 All in all, I think this is a pretty good plate of street meat. The portion is very large, but I think the gyro meat is tastier than the slightly dry chicken. For $6 you can definitely fill up, but I’m not sure it fully lived up to all of the hype. 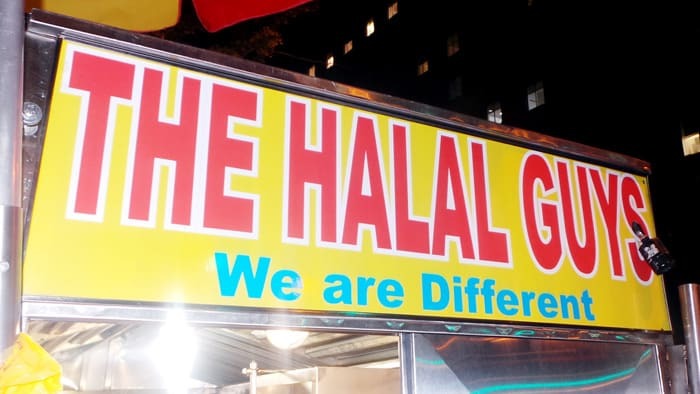 I even think my go-to Halal cart in TriBeCa might be better. Nonetheless, this a great addition to the neighborhood which thankfully has no line… yet.